Test your knowledge and see how much you know about diagnosing and managing pediatric community-acquired pneumonia. Did you get it right? Click here to find out! Earn CME for this topic by purchasing this issue. A patient suffering blunt abdominal trauma complains of suprapubic pain and has gross hematuria. Initial CT of the abdomen and pelvis with IV contrast is normal. Do yo know the answer? For trauma patients in the ED, life- and limb-threatening injuries take priority, but renal and genitourinary injury can have long-term consequences for patients, including chronic kidney disease, erectile dysfunction, incontinence, and other serious problems. Check out the issue on Emergency Management of Renal and Genitourinary Trauma: Best Practices Update to brush up on the subject.Plus earn CME for this topic by purchasing this issue. Sexually transmitted diseases are a growing threat to public health, but are often underrecognized, due to the often nonspecific (or absent) signs and symptoms, the myriad diseases, and the possibility of co-infection. Emergency clinicians play a critical role in improving healthcare outcomes for both patients and their partners. Optimizing the history and physical examination, ordering appropriate testing, and prescribing antimicrobial therapies, when required, will improve outcomes for men, women, and pregnant women and their babies. This clinical pathway will help you improve care in the management of patients with sexually transmitted diseases. Download now. A significant challenge in the management of pediatric community-acquired pneumonia is identifying children who are more likely to have bacterial pneumonia and will benefit from antibiotic therapy while avoiding unnecessary testing and treatment in children who have viral pneumonia. Worldwide, pneumonia is the most common cause of death in children aged < 5 years. Distinguishing viral from bacterial causes of pneumonia is paramount to providing effective treatment but remains a significant challenge. For patients who can be managed with outpatient treatment, the utility of laboratory tests and radiographic studies, as well as the need for empiric antibiotics, remains questionable. 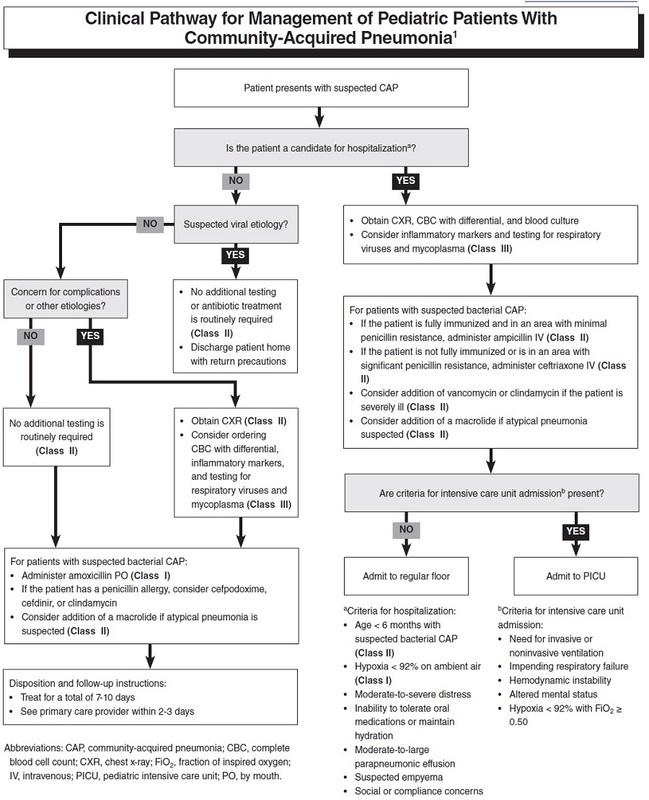 This clinical pathway will help you improve care in the management of pediatric patients with community-acquired pneumonia. Click here to download yours today. Your first patient of the day is a 2-year-old girl who tripped and fell while walking, hitting her mouth on the concrete sidewalk. On your examination, her left central incisor tooth appears to be fractured, with a yellow dot visible inside the tooth. The tooth is nontender and nonmobile. The parents don’t have the other part of the tooth and think it fell onto the street. You start to consider: How do you determine what kind of fracture this is and how serious it is? How does management differ between primary teeth versus permanent teeth, and how can you tell if this is a primary tooth or a permanent tooth? Do you need to do anything regarding the missing fragment? After seeing the 2-year-old girl with the chipped tooth, you realized that, given her age, this was likely primary dentition, which you confirmed with the parents. You could also tell on examination that the upper right central incisor was more of a milky-white color with a smooth edge, which is also consistent with primary dentition. You decided that the management priorities were to prevent further harm to the developing permanent dentition and to confirm that the tooth fragment was truly lost. You were unable to detect any retained foreign bodies on your physical examination, but you decided to obtain radiographic images to confirm. On facial radiography, there appeared to be a small foreign body inside her right upper lip. You repeated your physical examination and were able to extract the small tooth fragment. The girl’s left central incisor appeared to be an uncomplicated crown fracture. The girl was able to drink without difficulty. You did not have dental panoramic radiography available at your institution, so you instructed the parents to follow up with the girl’s dentist for assessment of her permanent dentition. You recommended a soft diet and to clean the tooth with chlorhexidine until the patient was able to see the dentist. Sign up for our email list below to get updates on future blog posts! A 26-year-old man arrives to the ED via private vehicle with his arm in a makeshift sling. He reports that his pet rattlesnake bit him on his right index finger about 45 minutes ago. His hand and wrist are swollen. He reports that he has no past medical history besides his 3 previous visits for snakebites. He reports having a “reaction” to the snakebite antidote during his last visit. You wonder whether the patient is immune . . . or should you give antivenom again? The 26-year-old man with 3 prior rattlesnake bites was at risk for significant morbidity related to this fourth snakebite, including impaired use of his dominant hand. Additionally, his initial lab values showed a developing coagulopathy. You decided to administer 6 vials of antivenom, but you ordered pretreatment with IV corticosteroids and antihistamines. You moved the patient to your resuscitation area for administration of antivenom and admitted him to the ICU for continued monitoring; fortunately, there were no side effects with the initial dose of antivenom. Test your knowledge and see how much you know about treating and managing pediatric hypertension and hypertensive emergencies. Test your knowledge and see how much you know about treating and managing blunt cardiac injury in the ED. Blunt cardiac injury describes a range of cardiac injury patterns resulting from blunt force trauma to the chest. Due to the multitude of potential anatomical injuries blunt force trauma can cause, the clinical manifestations may range from simple ectopic beats to fulminant cardiac failure and death. 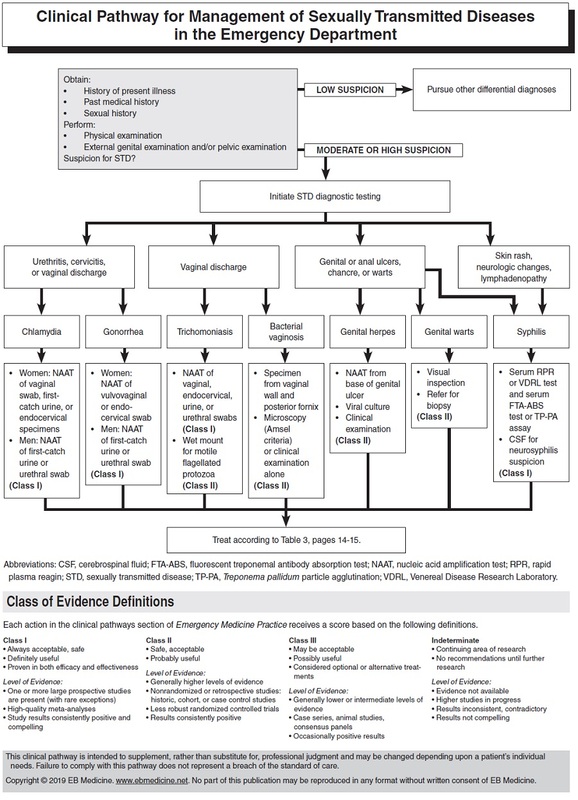 Because there is no definitive, gold-standard diagnostic test for cardiac injury, the emergency clinician must utilize an enhanced index of suspicion in the clinical setting combined with an evidence-based diagnostic testing approach in order to arrive at the diagnosis. This review focuses on the clinical cues, diagnostic testing, and clinical manifestations of blunt cardiac injury as well as best-practice management strategies. For children with severe acute hypertension without further evidence of end-organ damage, initiation of oral agents may be recommended to lower blood pressure. Based on the available studies, aggressive bolus dosing of antihypertensive agents should be avoided in the younger child; careful initiation of a drip for children who are symptomatic is a safer strategy. The therapeutic window for all medications is wider for adolescent children and, likely, none of the oral agents will cause inadvertent hypotension or side effects. For the school-age child, a careful discussion with a specialist will help guide decisions. 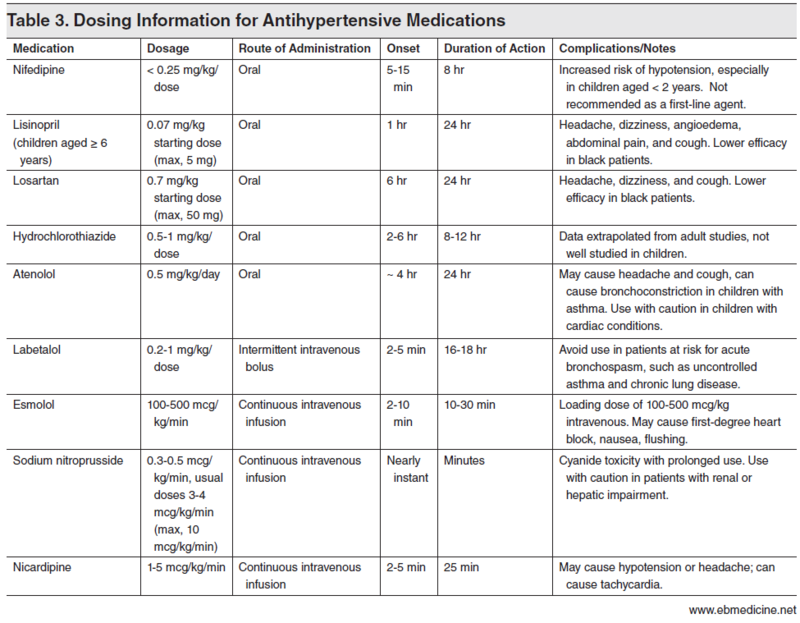 See Table 3 for dosing recommendations. 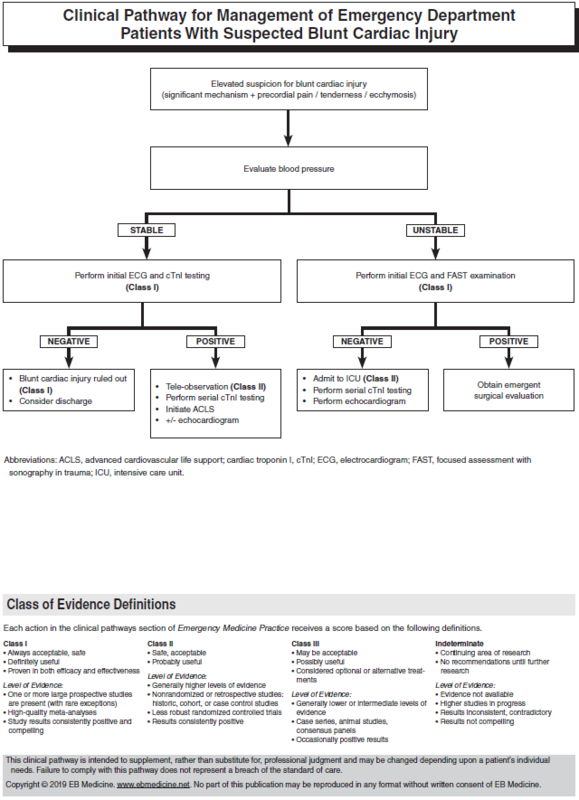 Download the table for yourself and check out more content like this at www.ebmedicine.net/topics.